This June you are invited to delight in the beauties of summer with us. An amazing yoga experience is waiting for you at the enchanting Cycladic Island of Paros. For the fifth year in a row Konstantinos Charantiniotis and Zeyneb Uras come together with Apostolia Papadamaki to offer, once again, a one of a kind retreat. Be prepared to enjoy seven long, warm, sunny days to the fullest, along with an international community of yogis and yoginis. Everyday we will celebrate life through inspiring yoga practices, heart opening mantra chanting, meditation, pranayama, lots of laughing, soaking in the sun and swimming at the crystal-clear Aegean Sea. Moreover, we will nurture our body, mind, and soul with the best quality delicious Greek food and by deeply connecting with the elements of nature around us. In our evening sessions, we will move our body gracefully just for the delight of it! Spirit Contact Dance, on the beach, will also lightfully guide you to a meditative state of movement and reveal your creativity with the innocence of a child. Aquatic bodywork, a full sensory floating experience will lead you in a delightful lightness of being while our sunset sharing circle will empower you to harvest the luminous gifts of our daily practices. That’s how we will absorb life force, recharge and rejuvenate, allowing the light that lives inside each and every one of us, come to the surface and shine bright! Join us no matter your level of yoga practice or your style. Everyone is welcome! Let’s meet and share this transformative experience that will highlight your most delightful Self. This event is organized by ESCEY TURİZM license number is 5333. 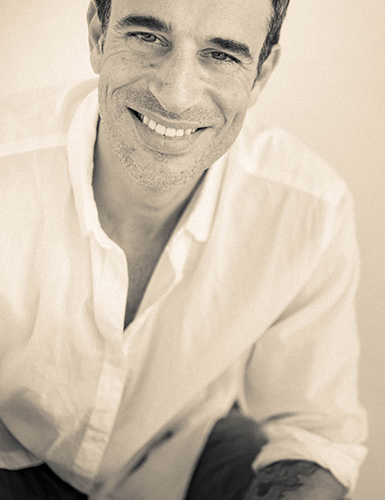 Konstantinos is a Yoga and Meditation Teacher, Holistic Wellness Coach, Ayurveda Practitioner, and devoted father who has dedicated his life to personal transformation. He has spent over 25 years studying, practicing and sharing Yoga. His diverse knowledge of human potential includes classic studies on physical education, Ayurveda, psychology, NLP and hypnotherapy. His approach to share yoga with others incorporates with philosophy and personal development techniques giving the participants the opportunity to develop an internal awareness that can truly transform their lives to the best. He lives in Athens, Greece working as a Wellness and Life coach. He is also traveling and teaching internationally and through his work aims to inspire people to live their lives to the fullest. Yoga Expert, Partner, and Manager at Cihangir Yoga in Turkey, Zeyneb first began yoga in Los Angeles in 1996. Since then, she has become one of the most influential yoginis, serving the Istanbul community with a loving light and nurturing soul. Zeyneb’s ability to inspire deep connection within herself and others is at the heart of her way of sharing, uniting yoga lovers from around the world. Her husband and her three sons are her biggest inspiration. Apostolia Papadamaki is an internationally acclaimed choreographer and transformational teacher, founder of The Happiness Retreat and Biomatic Anatomy Method. She studied Contemporary Dance, Contact Improvisation, Yoga and Alexander Technique in New York. A lover of movement, arts, and spirituality, she also studied Shamanism, Music, Voice, Diving and Craniosacral Therapy collaborating with inspiring artists and teachers in many lands. Endowed with profound spiritual insight and being thankful to life, she is transmitting her knowledge gracefully through her heart, voice, and hands with an anatomical precision always connected to the breath and she provides insightful guidance and tender support, empowering every individual to discover his own path to happiness with simplicity and playfulness. Okreblue Apartments is the perfect setting for our auspicious journey into our Yoga Retreat. With the sweet smell of thyme dancing in the breeze, this extraordinary and naturally beautiful setting offers the perfect heaven for tranquility, rest, positive energy and rejuvenation. Located on the beach of Santa Maria Bay, one of the prettiest beaches of the island, Okreblue apartments offer accommodations to suit your needs, from rooms with kitchenette to private studios. Okreblue is surrounded by nature, just a few meters from the seafront, overlooking the beautiful beach and crystal-clear water. The yoga platform at Okreblue is 140 square meters of wooden deck with wooden roof and bamboo walls. The owners Angelo and Sassy have nurtured this beautiful property for many years, ensuring that their guests can relax & enjoy the island’s gracious gifts of peace & nature, without any distraction. Room – type available Accommodation will be offered to participants at the rooms of Okreblue where all our yoga classes and meals will take place. Our first meeting and opening circle is at 17:00 – 19:30 where will get to introduce each other and followed by a grounding asana part. Wednesday, after the morning practice, is a free day to explore and enjoy the island for sightseeing and visit other beaches or the beautiful town of Naoussa. A bus service will pick us up from Santa Maria area in the morning, after the yoga class, we will take the boat that leaves from Naoussa (Paros) and takes us to Delos. Delos is an amazing island with 4000 years old ancient city and famous temple of Apollo, where we will stay for 2 hours, and is a must see! Our boat will take us to Mykonos Island, we can lunch at a Greek fish tavern if we wish, stay at the island about 4 hours, and then back to Naoussa Paros. The evening we come back around 18.30, and we have the opportunity to visit the city of Naoussa in Paros and go there for dinner. The cost of this trip will be 45-50€ per person, including bus and boat transportation and can be paid upon arrival at the venue. * This trip will be available if the weather permits. During your stay, you will have the opportunity to enjoy an Ayurvedic Yoga Massage. Ayurvedic Yoga Massage combines traditional Indian Deep Tissue Massage and Yoga-Based Stretching Therapies and is a very special treatment. Asana Practice and closing circle until 10:00. For all of you that have made your arrangements to leave in the afternoon, we will have a special area where you can leave your belongings, so you can enjoy the sea and sun! Price per person in a double room: 1150 Euros– brunch & dinner included. For registration please deposit 450 Euros. Full payment until May 22nd, 2019. For single rooms and rate, please contact us as there are very few, and you’ll need to book early. Classes are suitable for all levels. Space is limited; first come, first served. For more information regarding the registration and payment please contact us via email to register@konstantinosc.com . Full payment due by May 22nd. For cancellations received 30 days prior to the event: full participation fee minus €250 for admin, hotel and transaction fees. No refunds for cancellations in less than 30 days notice, unless we can fill your space. In case of retreat cancellation on our behalf, full retreat participation refund (ticket and transportation costs not included). In case of Retreat cancellation, full retreat fee refund (tickets and transportation cost not included).